From left to right : His Excellency, President Mnangagwa reading through plaque. Dr Masiye Kadoma hospital medical superintendent, Nico Muller, CEO Implats and Alex Mhembere CEO Zimplats look on. 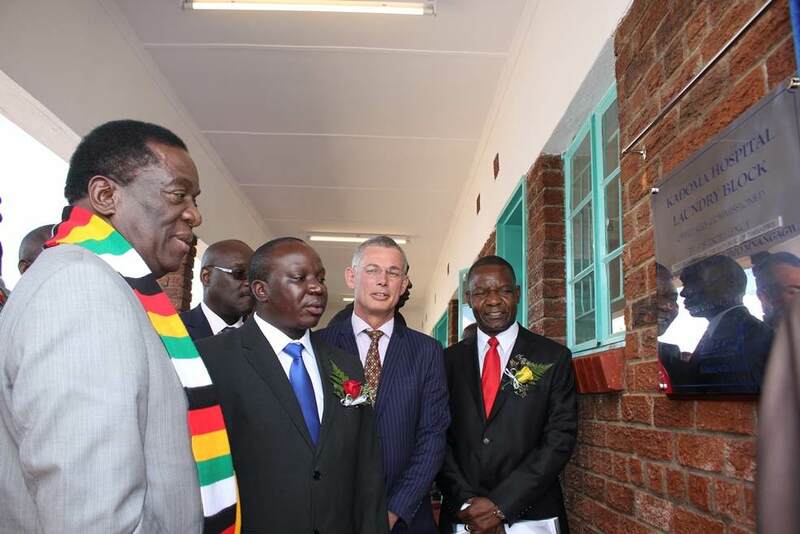 His Excellency, The President of the Republic of Zimbabwe, Cde Emmerson Dambudzo Mnangagwa officially commissioned the Kadoma Hospital Refurbishment project on 19 July 2018 where he also officially opened a new fully equipped laundry block and handed over an ambulance and a service vehicle. This refurbishment project was completed at a total cost of USD2.5 million. Kadoma General Hospital is part of the network of 1600 public health institutions in the country and forms an integral part of the health sector’s referral system. Speaking at the ceremony which was attended by the medical fraternity, government heads of department, community leadership and the private sector, His Excellency, The President of the Republic Of Zimbabwe, Cde Emmerson Mnangagwa acknowledged the role of the private sector and their willingness to work with the government in the modernisation and industrialisation agenda on the path to Zimbabwe’s economic recovery. “… I exhort other mining concerns in our country and private sector in general to emulate this sterling work that has been done by Zimplats and engage in Corporate Social investment programmes that meet the needs of the communities around which they operate,” said His Excellency. The President also highlighted the important role of small enterprises/ local service providers. He added that working with local enterprises on this project was a noble economic empowerment approach, and this Zimplats strategy is aligned with the government’s focus on economically empowering local communities and advancing their economic emancipation. Facelift of the outpatient’s department, mother and child block, paediatrics ward, both the main and small theatres; maternity ward and old nurses home. This project gave Zimplats an opportunity to demonstrate its commitment to socio-economic development through its work with local enterprises. This corporate social responsibility project took on board 6 local enterprises who are on the Zimplats Local Enterprise Development programme (LEDs). Three of the LEDs who participated in the project are female led. The LEDs programme seeks to empower small enterprises and build their capacity to offer competitive goods and services. At peak, the project attracted a labour force of 170 with 80% being drawn from the local community. The LEDs were responsible for project management, structural renovations, road works and plumbing, equipment supplies, steel fabrications and supply of building materials.